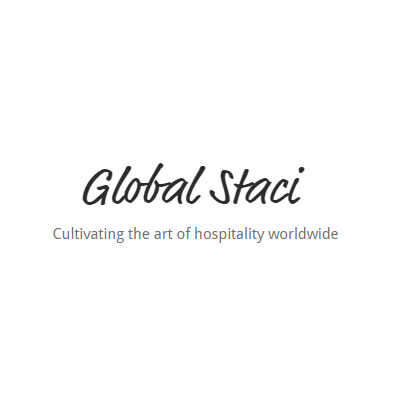 Opinions from independent reviewers and past guests. It’s all good! 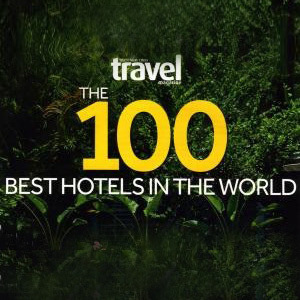 Mumbo is one of the Top 100 Hotels in the World! 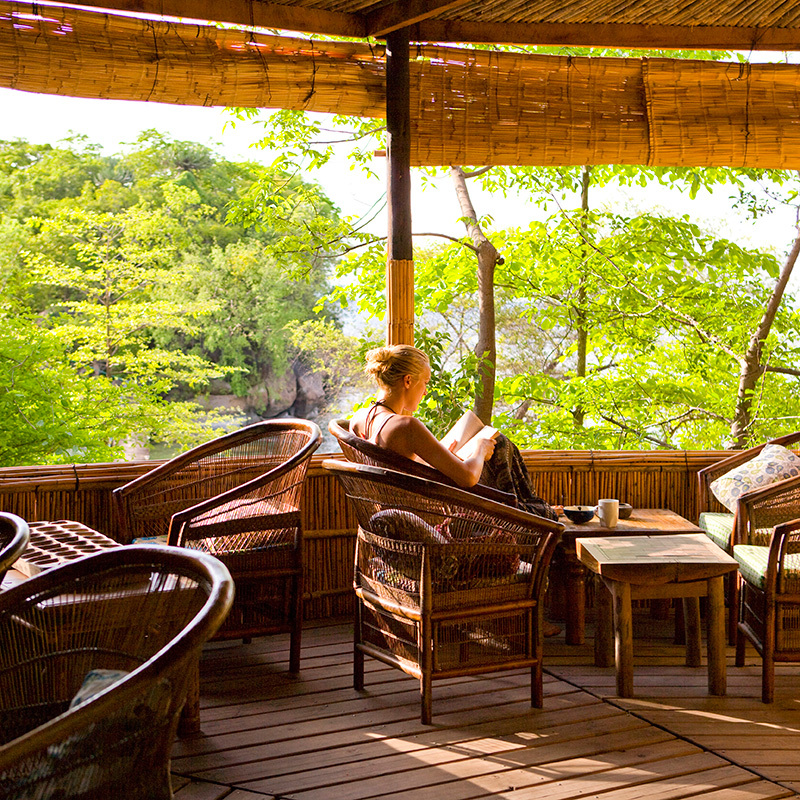 Mumbo Island Camp in Malawi was recently chosen as one of the Top 100 Hotels in the World in the United Kingdom’s Sunday Times Travel Magazine. Mumbo Island is an exclusive island camp on an uninhabited island that forms part of the Lake Malawi National Park. 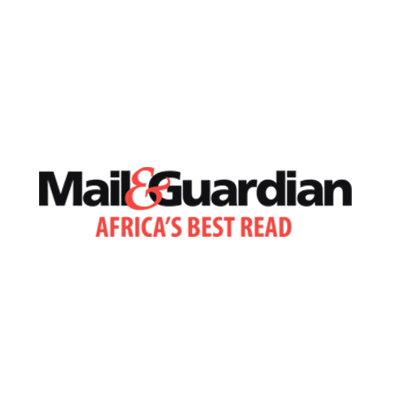 It has been owned and operated by Kayak Africa since the company was first awarded the concession to the island in 1996. Mumbo was one of only seven hotels chosen from Africa. 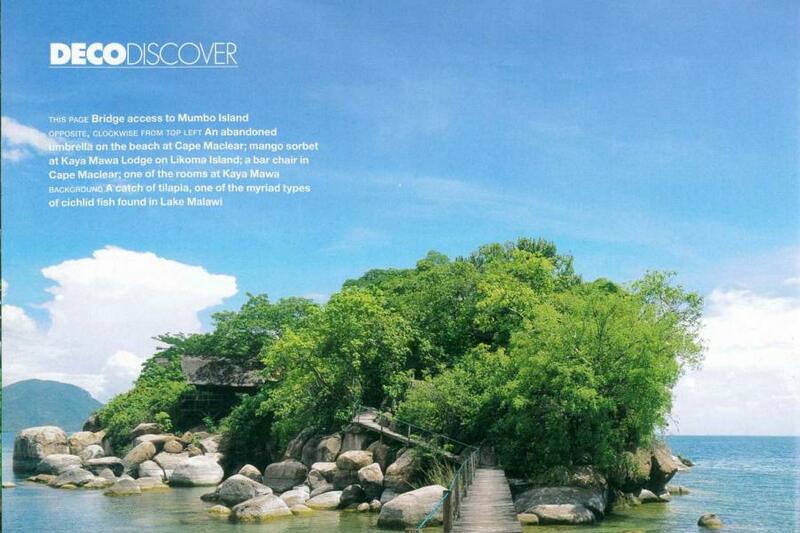 Mumbo Island and Domwe Island in February’s Getaway Magazine! 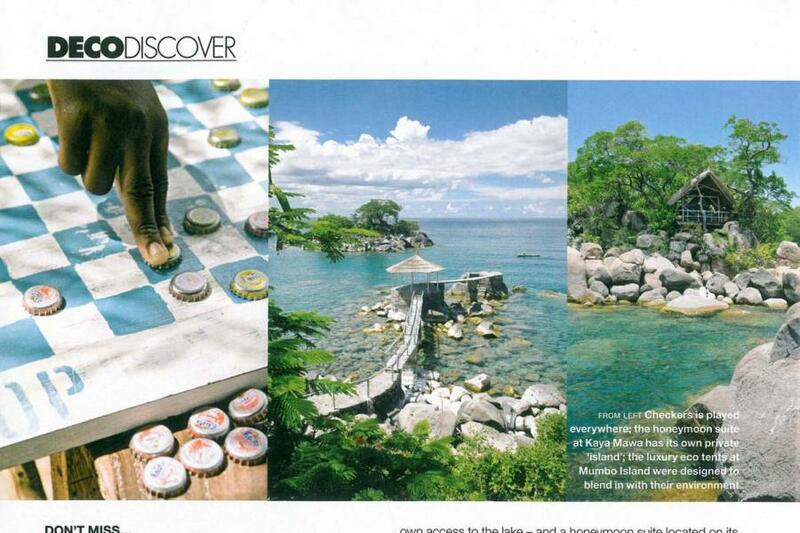 We are so excited to find our islands featured in two double page spreads in the latest Getaway Magazine. 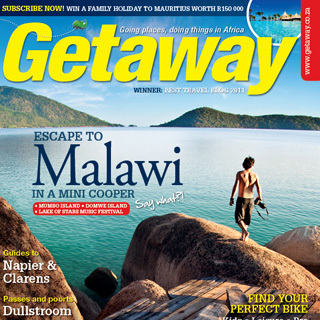 What a well-written article with great pictures of Malawi in general and Mumbo and Domwe Islands in particular. Called “Malawi in a Mini” the article is written by two intrepid gals who set off on a roadtrip from South Africa to Malawi and back in a Mini Cooper – and had an adventure of a lifetime. They offer great advice on routes, travel tips, backpacker recommendations – and thoroughly enjoyed their stay on both Domwe and Mumbo. 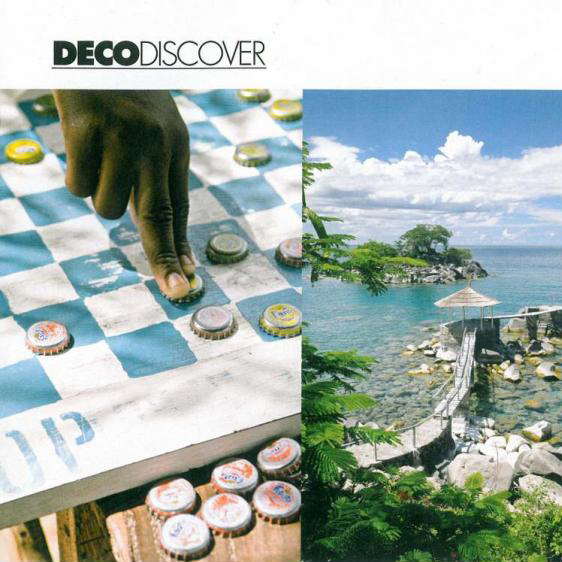 Mumbo Island featured in a gorgeous photographic essay by talented photographer Adriaan Louw in ELLE DECO South Africa’s December 2011 issue. Click on “More” to see the other pics. It isn’t only aging pop stars who should get to know poor but beautiful Malawi, says this journalist. 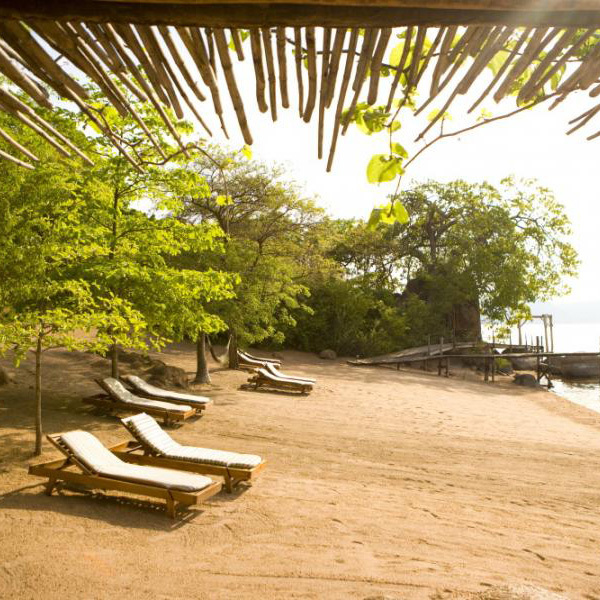 “…If Likoma seemed like heaven then Mumbo (a finalist in Times Travel’s Green Spaces awards last year) takes you even farther into a state of bliss. It’s important to know that the resort, unlike so many, pays more than lip service to eco-credentials – long-drop loos and no electricity are only the start. 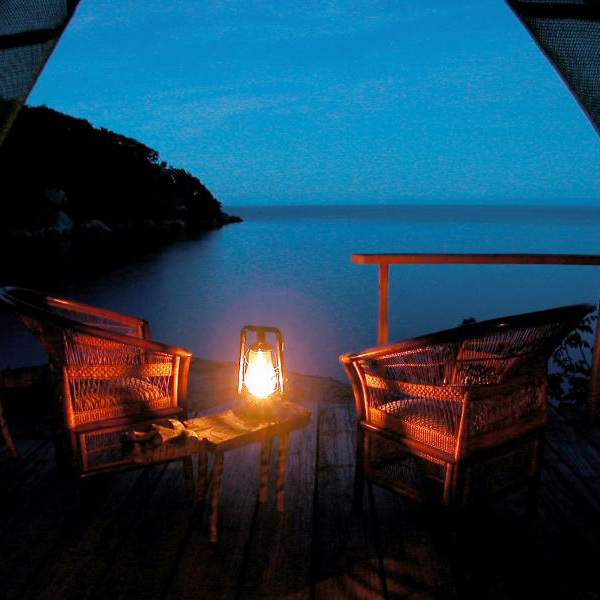 Accommodation is in luxurious safari-style tents set on headlands looking over the water. Bathrooms have bucket showers and biodegradable soap and shampoo. 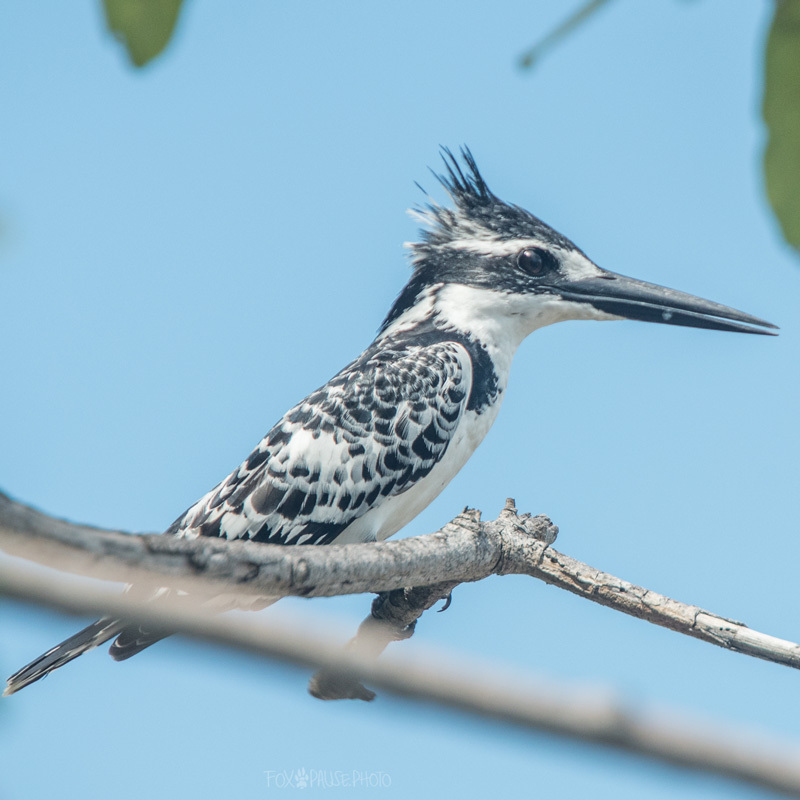 During the day I swam in the warm, crystal-clear water (there is bilharzia in certain parts of the lake, but neither here nor at Kaya Mawa) and kayaked offshore, spotting pied kingfishers and otters playing on rocks. After nightfall I chatted with the other guests, who included a London music producer who had relocated to Lilongwe with his family (with no regrets), and a Dutch couple who had come round to the idea of long-drop toilets so much that they booked two extra nights. Then I sat on my balcony, reading by gaslight and looking out over the lake at the dozens of pinpricks of light that were the lamps used by the fishermen in their dugout canoes. Their chatter and laughter drifted in the darkness until the early hours. I’m sure, despite the lack of gold taps and Egyptian cotton sheets, Madonna would have probably loved it on Lake Malawi, and should definitely bring her adopted local children here sometime. As she once sang, ‘If we took a holiday, / Took some time to celebrate/ Just one day out of life,/ It would be so nice . . .’ (fade to chorus). 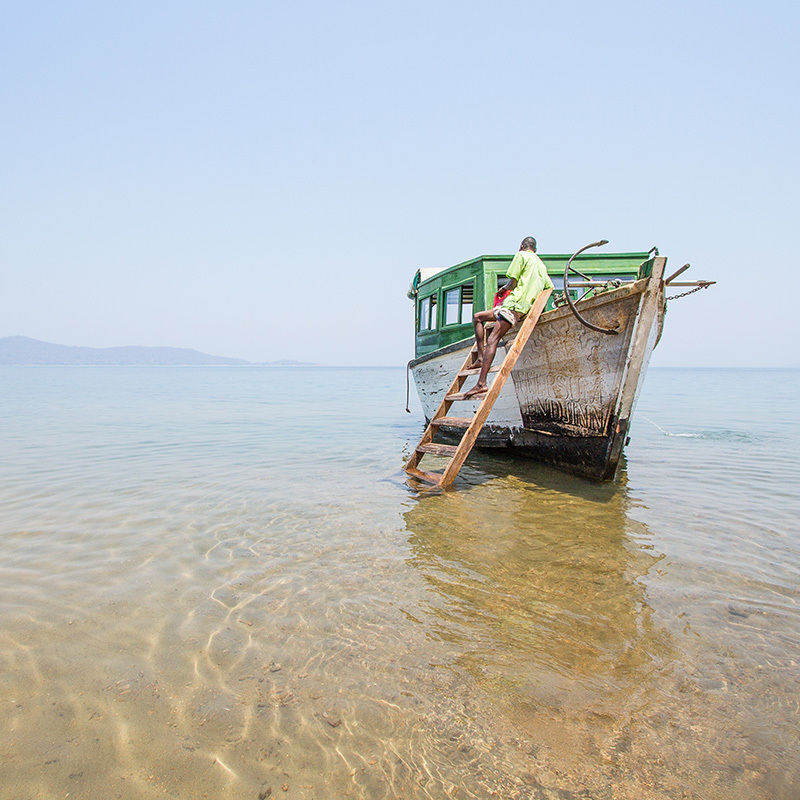 “… we run aground on the sand that fringes Lake Malawi’s Mumbo Island and sink toes into what’s best described as a sub-Saharan Eden. Shaded only by ancient fig and baobab trees, Mumbo remains uninhabited save for a community-run eco-camp of seven chic tents complete with solar-power bucket showers, wind-up torches and compost drop loos. … the tents are built into a second, smaller bouldered outcrop that’s joined to the main island via a twinkling walkway of solar powered fairy lights – the principal form of energy on the island. Read the full article at TNT Magazine. 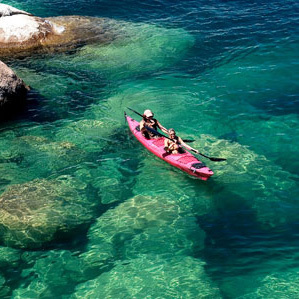 Lake Malawi is a vast freshwater streak up through the southeastern half of Africa. It captured the heart of David Livingstone, who stumbled upon it in 1866 and named its “delicious waters” Nyasa, meaning ‘iridescent’. The Lake of Stars’ calm, clear depths – famous for their colourful endemic cichlid fish – still draw travellers of every sort. Among these were the founders of Kayak Africa. 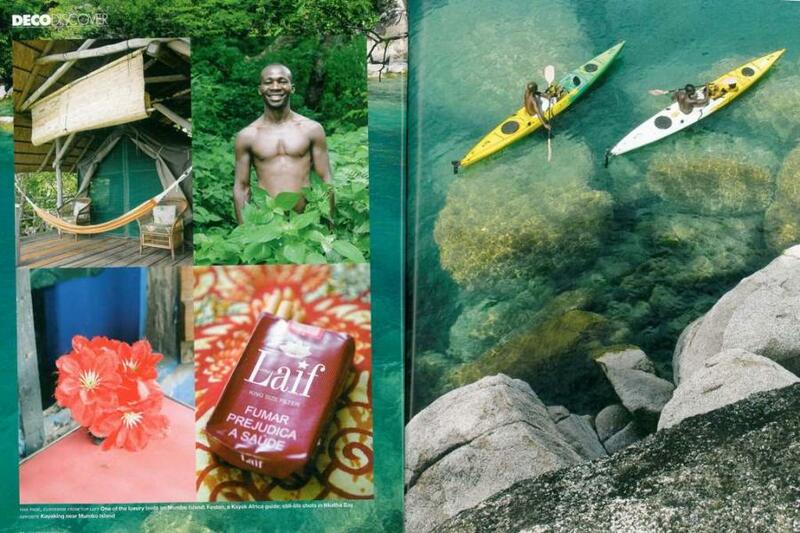 Seeking a new canoeing adventure, they paddled 10km from the mainland out to the uninhabited Mumbo Island. They instantly fell in love with the hidden beach, agreed a short concession for the island with the government and set up a makeshift temporary camp to which similarly intrepid kayakers were invited to paddle. The hardier breed of traveller wasn’t numerous enough to sustain the camp and things have changed. A motor boat now takes the traveller to the island, so the journey is blister free. The ‘leave no traces’ ethos – the owners’ passion, not a government condition – remains intact. You sleep in large safari tents pitched on thatched wooden platforms perched on boulders above the lake on an islet connected to Mumbo by a boardwalk. The bathrooms are built of local reeds and thatch, and – like half of Malawi, so the rumour goes – are held together with threads pulled from old car tyres. There are smart composting loos, into which you sprinkle wood shavings collected from village builders. The biodegradable bathroom treats are in refillable glass bottles.The shower is a bucket suspended from the rafters and filled with solar- heated water (of course). Drinking glasses are fashioned from old wine bottles. There are some lovely touches such as the Rocket Stove, a highly efficient Malawi-built cooking stove that’s so quick that the local employees are asking for some. Given the massive deforestation problems on the mainland the Lodge owners are exploring development of the stove. At night the island is a hideaway under the stars. There are no bright lights; solar lanterns mark the walkways and the gentle yellow flicker of hurricane lamps light the bathrooms. Almost all the food comes from nearby. All but 4 of the 54 full time staff are local. The plan is to train locals to the point where they are running the entire place and, in time, to generate enough money to plough back into planned community initiatives. 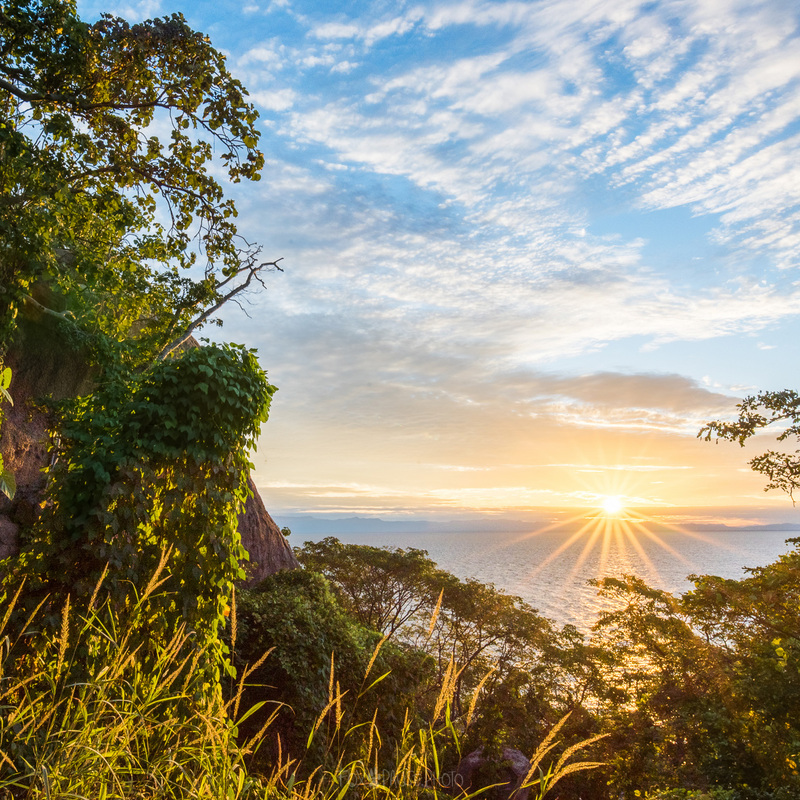 From the 400-metre high summit on the island, you get wonderful views of Cape Maclear. The walk up is not for the fainthearted, but it’s a chance to see wildlife that doesn’t occur on any of the other islands in the lake. Evidently this is because Domwe’s southern tip is not more than 100 metres from the mainland at a point called the Ilala Gap. Over millennia, the lake’s level fluctuated enough to allow large mammals to cross over. Domwe is now home to bushpig, bushbaby, monkeys, civets, klipspringers and a yellow subspecies of chacma baboon. The only mammal occurring on Mumbo, just seven kilometres away, is the Cape clawless otter. Mumbo may not boast many creatures, but it is a honeymooners’ utopia. Its safari tents are perched high over turquoise water, which is so clear you can see colourful cichlid fish swimming below. Monitor lizards cruise past snorkellers who sometimes, I’m told, are not quite as blase about the experience. Bays and rocky outcrops around the island are accessible from a well-marked circular path, although heading off it to a lonely beach, I discovered, could embarrass some honeymooning skinny dippers. It’s that kind of place. It’s also difficult to leave. I’ve traveled extensively around the world and within Africa, and its funny how I always end up forgetting how intense Africa’s beauty really is in comparison with some of the incredible places I have traveled to overseas. Africa’s beauty is in its rawness, its smell, its taste. And magical Mumbo offers all of that in abundance. Mumbo Island is the most peaceful place I have visited in Africa. A tiny island off the south of the lake – access is via boat transfer, or for the adventurous (read: Kev and Sooz), you can kayak out to it (approximately 1.5 hours). I’d recommend the latter as I think you really need to ‘earn your stay’ on this magnificent island. The entire island is run on eco-friendly principles with the premise being that, should they want to leave the island tomorrow, they could literally pack up what is there and the island would return to its original state in a few days – undiscovered, untouched. That means no electricity, no flush toilets, no ‘normal’ showers. And that is what makes it what it is! Your body clock quickly adjusts to ticking along in time with its original design – going to sleep when the sun goes down, and getting up when the sun comes up. Light is generated through a few paraffin lamps strategically placed along the pathways to the 5 tents on the island; toilets are ‘fancy long drops’ – the familiar porcelain loo which is based on a compost system, as opposed to a flush system – with compost being removed from the island and used by the local mainland community for agriculture; and showers are ordered 10 minutes ahead of time – with one of the friendly staff members bringing a bucket of hot water to your tent bathroom (all en-suite) and hoisting it into a ‘bucket-with-tap’ contraption that provides at least 10 minutes of a warm shower! Not that you need it after spending the swimming and snorkeling around the island! Although, it did help to relax tired muscles after completing one of the walks, watching the 30-odd bird species on the island, kayaking into caves in search of otters and bats, and jumping off 6-8m rocks to keep the adrenalin levels satisfied! And if that didn’t work, you could always play ‘chicken’ with one of the local monitor lizards around the island! For someone who loves the ocean, Mumbo is like the calm waters of some of the Mediterranean, without the salt content. Visibility is 30-40m easy and there are over 600 species of cichlids that reside in the lake – so snorkeling feels like you are in an expanded aquarium, surrounded by colourful, small fish that dart between rocks and coves. Its like a rainbow under there, with the odd ugly catfish making an appearance. Hell, they may look ugly, but man, they are tasty! 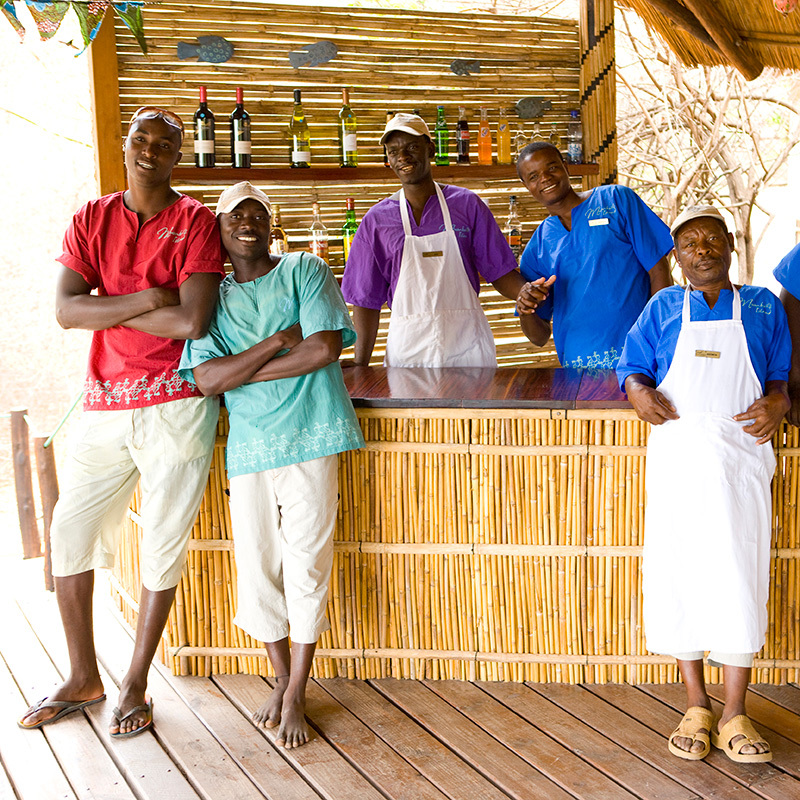 Speaking of food – Mumbo’s resident chefs know how to produce wholesome local cuisine to satisfy any hunger pangs after a long day of doing pretty much nothing but enjoying yourself in the sun. All you need to do is end the meal perfectly with a local Malawian gin and tonic. Mmmmnnnn – paradise. We just got back from a trip to Malawi, what a place. On our first day we took a stroll down the small village street in Cape Maclear from which the boat to Mumbo Island (see my flickr set) departs. The thing that struck me other than the raw beauty was how gentle the locals were, happy, always smiling, pretty amazing for people with so little. Every small homestead had a well tendered patch of maze planted in and among the indigenous trees, little gardens of eden. The super efficient guys at Kayak Africa operate the tours to Mumbo Island, well worth looking them over is you want the trip of a lifetime. More posts to follow. Over the years we have been to Bon Bon Island off the coast of Gabon, the Seychelles, Bazaruto in Mozambique, Mauritius, Maldives, and too many coastal resorts to mention, not one of them come close to Mumbo Island in Lake Malawi. 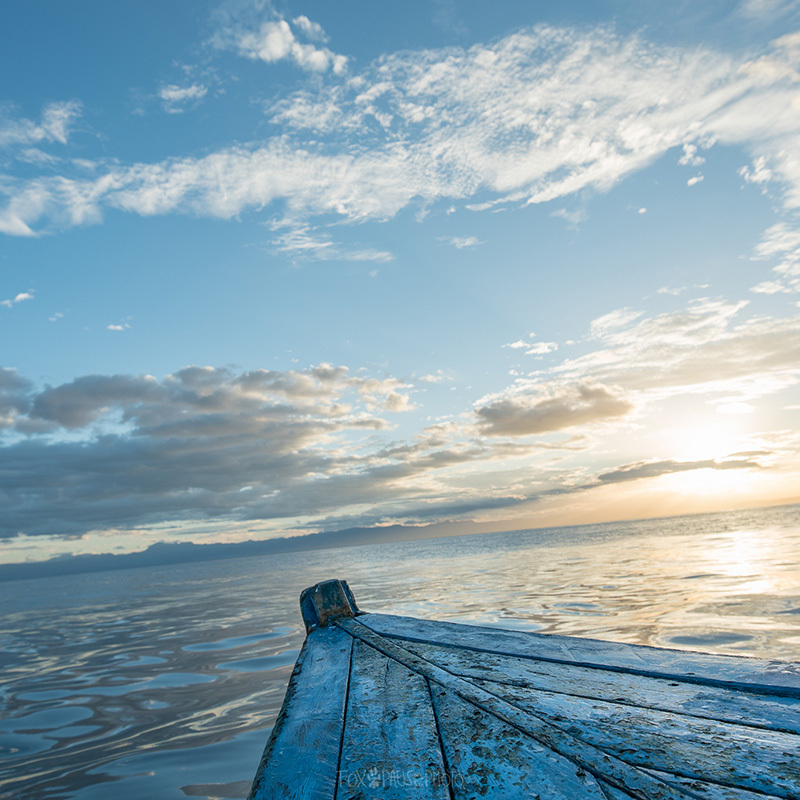 It’s a short (40 minutes) boat ride from Cape Maclear, a small village on the lake shore. Fresh, crystal clear water that’s teaming with tropical fish surround this tiny Island of granite boulders, a wide sandy beach, and stunning forest walks, It’s insane beauty wherever you look. What my flickr set doesn’t tell you is how cool the people treat you, not too in your face or fussy, just there to look after you whenever you need it. If you visit their web site (Kayak Africa) it will give you the low down, but take it from me whatever they say, it’s better. This is the last of my posts on Mumbo Island, at least until my next visit, well our next visit. We are getting a crew of family and friends together so we can take the whole island in April/May, 16 people in total, wana come along for the ride? We fell in love with Malawi to such an extent that we are on the way to building ourselves a comfy little shack on the shores of the lake, it’s going to be an amazing little spot.